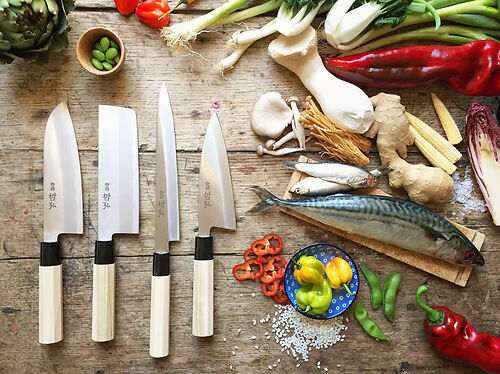 Hard wearing, everyday Stainless Steel kitchen knives - a great way to get into the feel and balance of Japanese knives, without the necessary discipline - they'll survive the odd outing in the dishwasher. The DSR-1K6 stainless steel is rust proof, and sharpens quickly and easily - use Shapton Stones every few weeks or so. Niwaki Tip: Learn to treat your knives with care - don't throw them in the sink, use a wooden chopping board, and store individually.